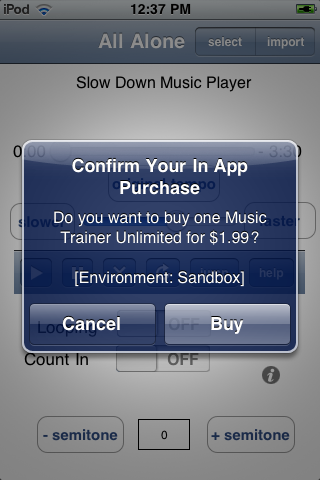 Note, to purchase the upgrade you must have a network connection and be able to connect to iTunes. Be patient. 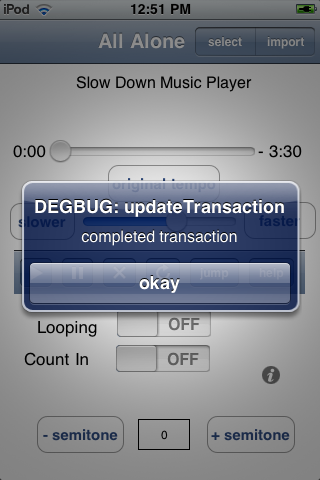 Depending on the speed of your network connection and activity on iTunes, it can take a little while to complete the transaction. 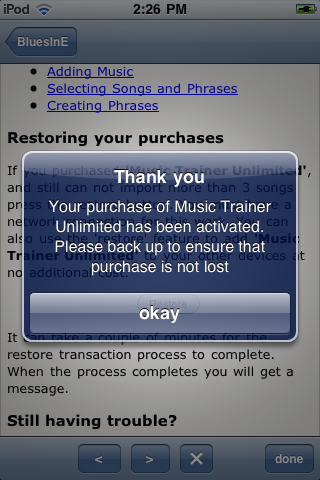 How to Purchasing "Music Trainer Unlimited upgrade"
Purchasing "Music Trainer Unlimited upgrade"
If you go to the help screen or try to import more than 3 songs, you will be presented with a prompt to purchase the upgrade. Simply press the purchase button. The button displays the current price for the upgrade. 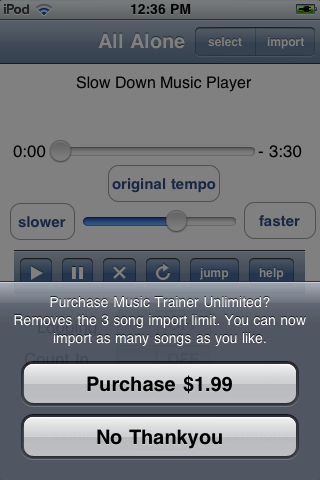 The price displayed on this page may not reflect the current price in the iTunes store. If you already purchased you will be presented with the following alert. There is no harm pressing the "okay" button. You already purchased this upgrade and will not be charged again. 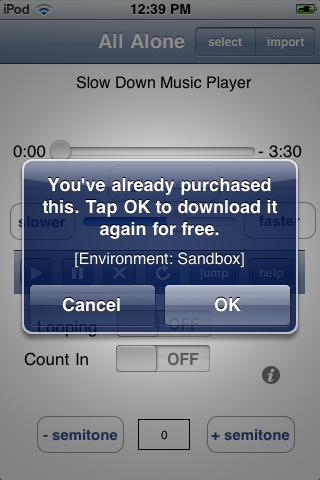 Pressing "okay" will cause the app to contact the iTunes store and down load your purchase again. finally you will see that your purchase was activated. 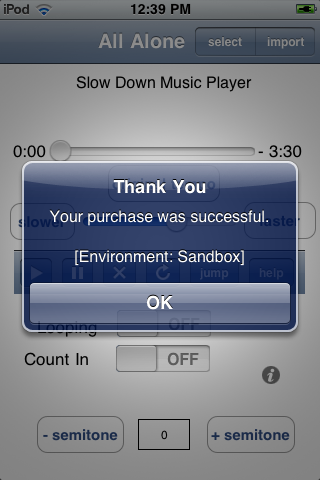 Once your purchase has been activated its a good idea to sync with iTunes so that the record of the purchase gets backed up. This will make it easy to restore in the future. The back up is not absolutely required. If you need to you can restore your purchase by "going through the purchase process again as described above our using the restore feature. If you purchased the upgrade but for some reason are still being prompt to purchase the upgrade there are several ways to re activate your purchase. 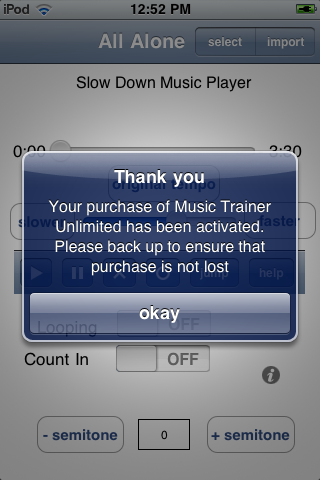 As outlined in Purchasing "Music Trainer Unlimited upgrade" there is no harm going through the purchase process again. You will not be charged a second time. 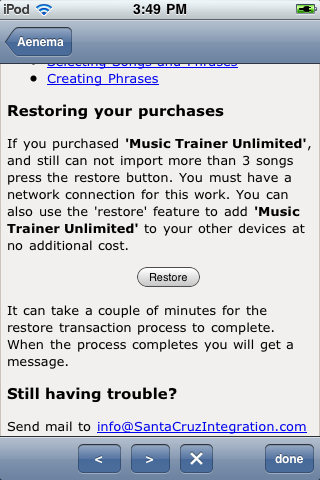 The restore functionality will contact iTunes for you and cause your purchase to be re-activated. Press the "help" tab on the help screen and scroll down and press the "restore button"